We’d like to introduce you to WebReservationsDirect.com, the commission free online reservation system developed specifically for the independent hotelier. Our solution seamlessly integrates into a hotel’s existing website and is designed to appeal to a wide range of Internet users that are actively searching for a hotel to make their reservation. WebReservationsDirect.Com provides free services such credit card fraud protection and SMS alerts when new reservations are generated, and even supports multiple room types/occupancies on a single reservation (ideal for small groups). What really sets WebReservationsDirect.Com apart from other booking engines and OTAs (Priceline, Booking.Com, Expedia, etc.) is that our system is flexible enough and is priced so that hotels can offer lower rates than those published on OTA websites (without breaking Rate Parity) and the ability for a hotel to offer guests greater value using a only a fraction of the amount that would otherwise be paid in commission fees. If you are an independent hotelier and are responsible for managing your hotel’s daily operations and the one paying the bills, WebReservationsDirect.Com is ideal for you. Harrison Consulting, Inc. used this feedback to develop WebReservationsDirect.Com, a reservation system that gives Internet users exactly what they asked for. The result is an attractive and informative reservation interface that works on every desktop, mobile, and tablet device, enables users to quickly make and change their selections, and allows them to complete the entire reservation process in less than 3 minutes. Please, review Harrison Consulting, Inc.'s Demo Hotel to see how our booking component integrates into any website or go directly to the Demo Hotel’s reservation system. OTAs (online travel agencies) such as Booking.com, Expedia, Hotels.Com, etc. 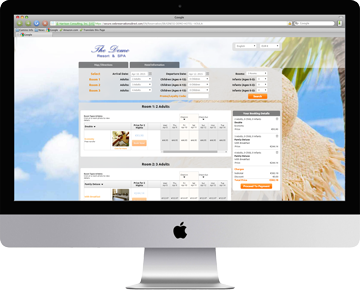 display a variety hotels, rooms and room rates based on a user’s desired location and arrival/departure dates. For this service, the hotel pays a commission between 15% and 30% which is ultimately passed to its guests. Additionally, the OTA prohibits the hotel from selling its rooms on its own website at a rate lower than that listed with the OTAs. WebReservationsDirect.com was created with a different philosophy: to give hotels the freedom to provide their guests with the best value possible. WebReservationsDirect.Com does not charge commission and our system was designed specifically to allow hotels to publish Room-Packages that won’t violate the “rate parity” clause in a hotel’s OTA agreement. Passing a 15% - 30% savings or providing more services and perks that would otherwise be paid in commissions doesn’t just make a hotel more competitive but it makes it extremely attractive to any potential guest. 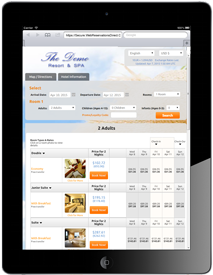 WebReservationsDirect.Com’s billing is structured to give hotels a competitive advantage. WebReservationsDirect.com charges one low annual subscription fee and just $5.99 for each successful reservation. Unlike an OTA, we do not don’t impose “Rate Parity” restrictions, we don’t require a minimum room allotment, and we don’t put limits on the number of Room-Packages a hotel can list. OTAs charge anywhere from 15% to 30% commission for reservations that are booked through their website. On the surface, it might appear that this is a reasonable cost of doing business. However, taking into account the variety of expenses, such as taxes, payroll, healthcare, utilities, insurance, advertising, miscellaneous operating costs, and perhaps a loan or two, that 15% to 30% commission can easily translate into an eye watering 30% to 60% or more in profit. WebReservationsDirect.Com does its part to help by increasing your conversion rate from visits to your website to reservations... commission free! Saving time is just as important as saving money. We’ve engineered our extranet to be just as user friendly for the hotelier as our reservation interface is for their guests. Every time a guest books a reservation, WebReservationsDirect.Com automatically sends the hotelier an email, an SMS message, and a fax notification at no extra charge. The hotelier simply logs onto our extranet, prints out the reservation, and enters a confirmation code. WebReservationsDirect.Com handles the rest. The system updates inventory, generates a PDF confirmation and e-mails it to the guest. The best part is that changing packages, rates, discounts, room allotment, or modifying minimum nights stay, are just as simple.